Below you can view all the homes for sale in the Heather Glen Summerlin subdivision located in Las Vegas Nevada. Listings in Heather Glen Summerlin are updated daily from data we receive from the Las Vegas multiple listing service. To learn more about any of these homes or to receive custom notifications when a new property is listed for sale in Heather Glen Summerlin, give us a call at 702-323-5933. Remarkable home perfect for entertaining* Flowing floor plan through out with a loft* Kitchen fit for a chef with granite counter tops and breakfast bar* Generous size Owner's suite with attached bath and walk-in closet* Backyard with sparkling pool with a waterfall and slide and built in BBQ* Remarkable addition adds tremendous value to the second master suite and luxury home theater* MLS#2083801. Keller Williams Realty Southwe. 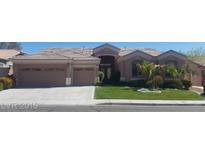 Walking Distance To The Downtown Summerlin. Won'T Last. MLS#2082624. BHHS Nevada Properties.